Since the school year started, we’ve been making improvements to the Class Notebook add-in for OneNote on the desktop. Here is a summary of the highlights—as well as details for the update releasing today. To update your OneNote Class Notebook add-in, just click the Update button on your toolbar to download and install the latest version. If you’ve never installed the Class Notebook add-in, you can get it from the OneNote Class Notebook website. Notebook mapping—If your notebook name and LMS/SIS course name match, the Class Notebook add-in will automatically map the two together. 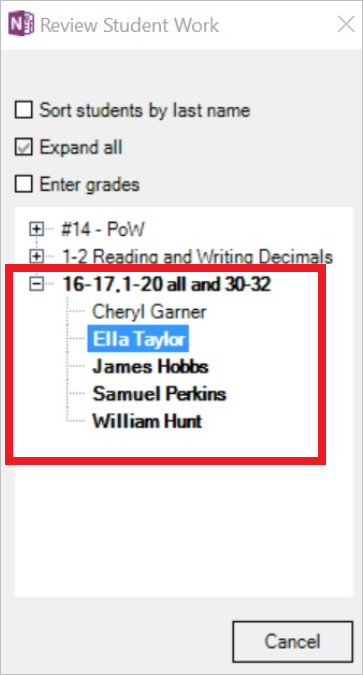 Student mapping—If the format of your students is <LASTNAME>, <FIRSTNAME>, the student names will be automatically mapped. We have provided additional LMS support for SEQTA by adding assignment and grading integration. Also, we made some performance improvements to help speed up page distribution. Here is a detailed summary of all the new capabilities and improvements to the Class Notebook add-in over the last few months. This list can also be found at the bottom of the Class Notebook add-in support page. Automatic mapping of Class Notebooks. Automatic mapping of students by last name, first name. Refresh tokens so teachers only need to sign in to the LMS/SIS once. Display a warning when distributing pages that contain attachments. Apostrophes in section names now preserved correctly during page distribution. Fixed an issue with grading in MS Classroom courses with many assignments. Fixed issue affecting Schoology sign-in. Fixed issue preventing student mappings from getting saved. Fixed bugs that happened with certain content types for page distribution. Read/unread state for Review Student Work assignments and distributions. Performance improvements for page distribution.